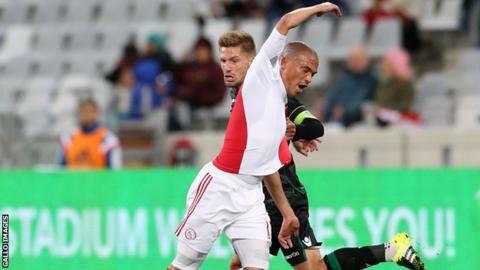 Ajax Cape Town of South Africa won the first leg of their African Confederation Cup first round match in Angola, beating Sagrada Esperanca 2-1 after reversing a decision to withdraw from the tournament. Ajax, concerned with internal travel arrangements in Angola, honoured the fixture after South Africa's Football Association (Safa) said they would face severe sanctions if they did not go. Ruzaigh Gamildien and Riyaad Norodien grabbed vital away goals for Ajax, with Antonio Oliviera scoring for the hosts. In other first round first leg ties, Tripoli-based Al Ittihad began their Confederation Cup campaign with a resounding 4-1 win over visiting Sonidep from Niger on Friday. The Libyan club played their match in Tunisia at the home of Stade Gabesien, about 400km along the coast from Tripoli because of the war in Libya. Al Ittihad are looking to go one step further than 2010 when they reached the semi-finals of the Confederation Cup. Stade Gabesian were also in action themselves on Friday as they travelled to Bakaridjan in Mali where it finished 1-1. Two-time African champions Esperance from Tunisia and Morocco's FUS Rabat have a bye and so will see action from the first round in March. The second-tier Confederation Cup has been hit by the withdrawal of Gaborone United of Botswana and Wallidan from The Gambia, giving JKU of Zanzibar and Mouloudia d'Oran byes. The return leg matches will be played on the weekend of 26-28 February with the overall winners advancing to the round of 32 to be played from 11-13 March.